We all know the world of difference that Education Support Professionals (ESP) make every day in the lives of students. Nominate an outstanding ESP member for the Leon Brunner Award, and sign up to attend the ESP Statewide Conference in March where the winner will be announced. There would be no school without great para-educators, clerical staff, food service workers, custodians and maintenance workers, and transportation employees. Take some time to nominate an ESP member in good standing who has done outstanding work and is deserving of being recognized with the Brunner award. 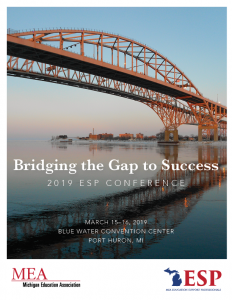 ESP leaders and members who attend the March 15-16 conference at Blue Water Convention Center in Port Huron will network and train on topics such as legal issues, ESP certification, privatization, school violence, and member outreach and engagement. Register for the conference today! The Brunner award is given at a special dinner and award ceremony on Friday night of the conference. Nominations for the award are due by close of business on Feb. 15.